If you are toying with the idea of implementing copper vent caps in your home, there are a few key considerations to make before investing. The first question to ask yourself is what type of copper wall vents are going to work best in your home. We offer round, rectangular, flat louvered, cone top shanty, and copper flange copper wall vents, in addition to other types that will work well in your attic, bathroom, and kitchen. Together with our clients, we help you choose the copper vent caps that will work the best and look the best in your space! Here at FAMCO, our goal is to add to the overall aesthetic of your space as well as help customer install a ventilation system that is efficient and long lasting. While it may be tempting, we do not advise customers to cut corners when it comes to roof vents, wall vents, gable vents, and chimney caps. Choosing low quality vent caps can lead to unwanted mildew growing in one’s space that can slow down the efficiency and air quality over time. Many customers are choosing copper vent caps because they are weather resistant, hold up over time, and will not rust when exposed to extreme cold or heat. The copper adds a rustic and “lived-in” aesthetic in a home, which makes the copper a desired choice over plastic alternatives. Simply put, copper vent caps look great! Additionally, copper simply lasts longer than plastic or metal products, which tend to be thinner. 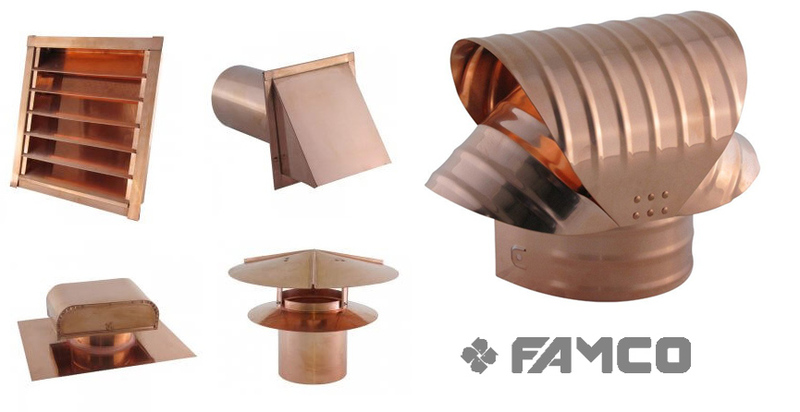 Our inventory also includes copper chimney caps, plumbing flanges, dampered vents, attic/exhaust vents, eave soffits, and copper gables. If you are looking to upgrade or build a method for air ventilation, look no further than FAMCO. Headquartered in Meridian, Idaho we help customers in the state, country, and throughout the world in finding an air ventilation method for their bathroom, attic, and kitchen! Copper vent caps easily beat out plastic and aluminum vents that are not as efficient and often times ruin the aesthetics of your space. As they age, copper vents tend to look even better, blending in with the overall look of your room and continue to provide top quality air ventilation. Previous post: Should you Choose Copper or Galvanized Steel Vents?